I'm sure I don't need to tell you that Mad Men is back — the news is pretty much everywhere these days. I, for one, am beyond excited; the last two Draper-less years have amounted to what I like to call "The Dark Ages" (saved from total ruin by one of my new favs — Homeland — and reruns of one of my olds favs — The West Wing). But even if you're not a fan of the show, there are a lot of wonderful career lessons that you can take from it and apply to your career in the arts. Don't believe me? Then stick around as we look at 5 Career Lessons From Mad Men. The main reason for Don Draper’s success is his almost preternatural understanding of his audience. Season after season has shown Don creating ad campaigns that truly resound with print, radio, and television audiences. And while it’s clear that he has an innate talent for what he does, he undoubtedly has to research the markets that he’s advertising to. It’s a crucial part of his job…and your job. That’s right, market research is the basis of your marketing plan. Is my office half-empty or half-full? I can't be bothered with such nonsense — I've got market research to do. Think about it: how could you possibly know how to sell yourself and your talent if you have no clue about the market you’re targeting? You’ll save yourself a whole lot of time, energy, and money (not to mention frustration) if you do the research before you start putting your materials and your plan together. So, do as Don does: Know. Your. Market. These players know the players. Before Don can even start on market research, he has to get a meeting with a client. This is where Roger Sterling and Pete Campbell come in — they’re the account guys. Their job is to build relationships with clients, and in order to do this they need to do their research much like Don needs to do market research. Who are the players? What's currently going on with their companies? What are their needs? How does this relate to you? Well, you’ll likely be looking to grow relationships with agents, managers, casting directors, producers, publishers, etc., and the best way to begin that process is by doing your homework on them. I touched on this in the two recent marketingblog posts and I will say it again just to hammer it home: understanding who you’re looking to build a relationship with and why you want a relationship with them is the first (and most important) step in reaching out to your future network. It goes without saying that the world of advertising in the early 60s was a man’s world. Women, who would eventually make a strong push into the executive ranks in the 70s, were often relegated to roles as secretaries and switchboard operators. 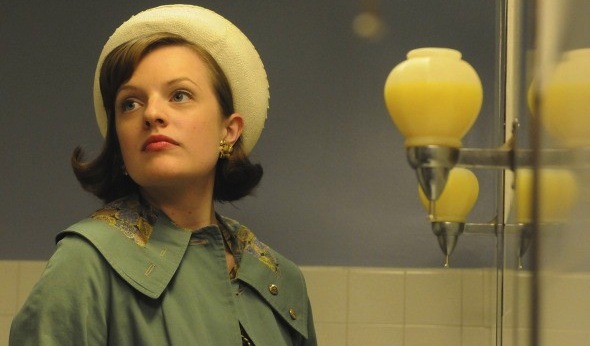 Peggy Olson was one of the former when she started working at Sterling Cooper, but she aspired to something bigger; slowly yet surely she began to assert herself and her creative talents, making it impossible for the men around her to ignore what she brought to the table. It wasn’t always easy, and she had many moments of trepidation. But, in the end, she had the fierce courage to create her own destiny — so much so that Sterling Cooper Draper Pryce would be a MUCH different place without her. What am I looking at? My future. And I'm not afraid to own it. How this relates to you is obvious. Sometimes you need to take risks and trample all over your fear in order to reach your goals. You usually need to step outside of your comfort zone in order to find the success you're looking for. Simply put, let fierce courage be your guiding light. Oh, just hangin' around in this old thing. Being my awesome self. If there’s one person on Mad Men who knows how to leave an impression, it’s Joan Holloway (Joan Harris, for you sticklers). Sure, that’s not hard to do when you’re a statuesque, redheaded bombshell. But, honestly, that’s only going to get you so far. The truth is that Joan’s also got personality to spare, and she’s never been shy about flaunting it. Yes, she can flirt with the best of ‘em, but she also tells it like it is and can cut an overzealous man to shreds with a simple look. The result is a personality as vivid as her flaming red hair, and one that she makes no excuses for. Unlike Don, who can be a hard read (and who is ever-anxious about people discovering who he really is), Joan makes other people feel comfortable in her presence. Look, it’s no secret that our industry is full of phonies. And I know that it can be difficult not to try on different faces in order to please other people — particularly those that you’re trying to impress. But, in the end, nothing will impress others more than authenticity. This is one situation where you DON’T want to be Don Draper, trying to keep all of your facts straight, wondering who you should be at any given moment. It will cause you more trouble and angst than you can imagine, so do yourself a favor and stay true to who you are. In the end, people are drawn to — and remember — authenticity. Poor Betty Draper — she gets such a bad rap. Granted, she doesn’t do herself any favors in the parenting department, but I still feel for her. She’s one of the few characters on the show who doesn’t get to spend her days doing what she loves. Of course, much of this has to do with the times themselves, with Betty taking on the role that was likely assumed of her: housewife. Clearly, she doesn’t love it. This is not to dog on being a housewife, which is a job in and of itself. And evidence would point to some of Betty’s friends loving the life they lead, caring for their children and their household. But Betty just doesn’t seem suited (or emotionally equipped) for such a duty, hence that ever-present sense of sadness about her. By contrast, one thing you can say about the crew at Sterling Cooper Draper Pryce is that they are passionate about what they do. Their personal lives may be disasters on occasion, but they put their hearts and souls into their jobs because they simply love what they do. This was all the more evident when they defected from the original Sterling Cooper as they realized that they would be subject to a system that hampered their talents. The thought of being restrained from what they do best, in any way, was like being straightjacketed. Yes, much of it had to do with egos, but those egos partially stemmed from the knowledge that no one did what they did better than they did it. In the end, it was about love of the work itself. I don’t need to tell you that the entertainment industry can be just as brutal as Mad Men’s ad industry. It’s not for the feint of heart. So, if you’re going to put everything you’ve got into it, you sure as hell better love it. If not, the risks aren’t worth it. But, if you do, the rewards are that much better! The gang from Sterling Cooper Draper Pryce. In it to win it.